Home > Sports > Pocket Card Jockey is the cutest thing ever. EVER. 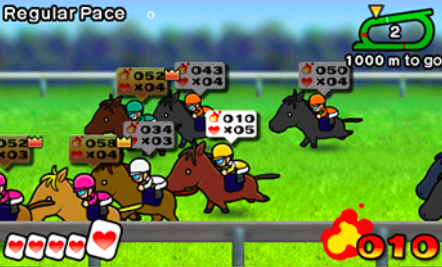 Pocket Card Jockey is the cutest thing ever. EVER. Due for a full release next month, a little demo for Pocket Card Jockey has arrived on the Nintendo 3DS, and immediately I have fallen in complete love with it. 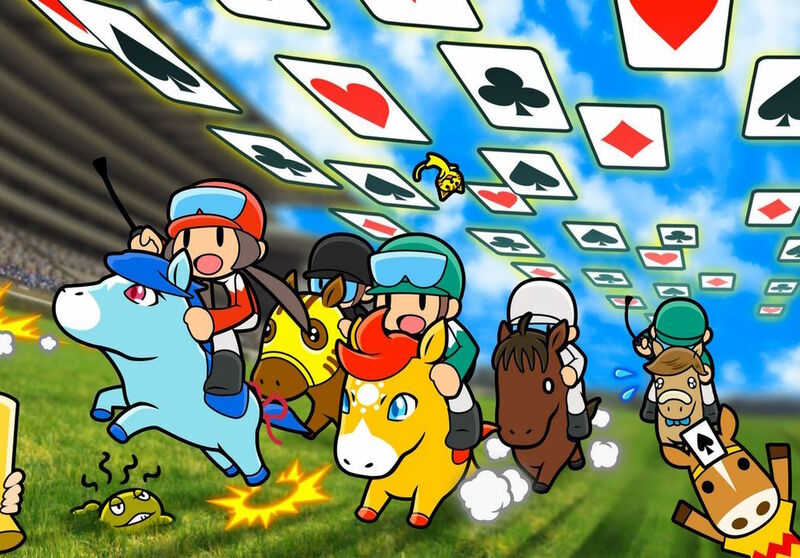 In the same way that Nintendo Pocket Football Club immediately grabbed my attention thanks to its ultra-cute art style, and then held it with its deceptively complex gameplay, Pocket Card Jockey clearly has a delightfully deep set of systems behind it support the ridiculously kawaii art style. Related reading: Nintendo Pocket Football Club shares a similar design philosophy to this game; get 'em in with the cute, keep 'em playing with the depth. I'm going to save the in-depth discussion on the game's various systems for the review, as there's a lot to work through, and if you've got a 3DS you can experience it all for yourself for free without needing to wade through my description. What I will say though is that it mixes up a couple of clever systems in a way that I would never have thought possible, and truly, whoever was able to link all these systems together is a mad genius. 1) There's some light management structures in place, where you'll need to manage your horse, level him up, develop his skills, and buy stuff for him that will improve his performance on race day. 2) While racing, you'll need to focus on the movement of the horse, positioning him in his ideal comfort zone (does he like running at the front of the pack, or is he more comfortable sitting in the middle?). You'll also need to make sure he doesn't run into other horses, and isn't taking corners from a wide angle, which would slow him down and use up excess energy. 3) At various points through the race the action will stop to allow you to play a game of solitaire, where you'll have a layout of cards, and you'll need to remove them by matching the current "in play" card with a card that is a value of either plus or minus one. So if there's an 8 currently in play, you'll need to match it with a 7 or 9. The more cards you remove within the time limit, the more energy the horse will have and the better his mood, which will help him race better. 4) Finally, there's the home stretch, where you'll need to make sure the horse sprints in at first. Here you can use up excess energy points to "whip" the horse to move faster, but try to conserve them, because if you've got some left, it becomes experience, which helps the horse level up faster. See? There's a lot at play within the game, so you'll come for the ultra-cutesy art style, but end up staying for the system-rich and nuanced systems at play. Each of the above four systems feed into the others, so you'll need to be good at them all in order to be a successful jockey. 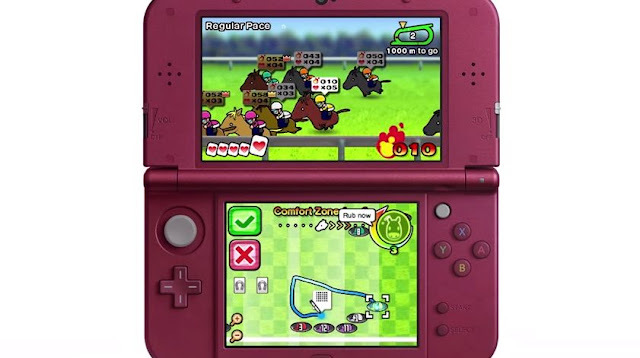 As you can probably guess from the art style, the game also has a wicked sense of humour, with a narrative that is silly and irreverent of a wannabe jockey who is trying to earn his way up the ranks. Every pore of this game is dripping with personality and charm, and if my time with Nintendo Pocket Football Club is anything to go by (somewhere in excess of 200 hours), I suspect that this is going to be a little gem of a game that is sprung on me unexpectedly and ends up being a front runner (hah, pun!) for my game of the year. Also noteworthy that while I do make the immediate comparison to Nintendo Pocket Football Club, this game is actually developed by Game Freak, the same developer as the long-running Pokemon series. Though Game Freak has experimented in a limited sense with games outside of the Pokemon franchise (HarmoKnight being a good example), I see this as the team's first attempt to establish a major new franchise. I would bet my house that if this game takes off and becomes successful, we'll see more of it into the future; the entire project simply has an air of something ambitious and something that's aggressively trying to be fresh and new. Related reading: HarmoKnight was another attempt by Game Freak to break away from its reputation as "the studio that just does Pokemon." The full game releases in a couple of weeks, but progress made in the demo can be transferred over, so you've got no real excuse for not getting into this one now. Snap to it, jockeys!